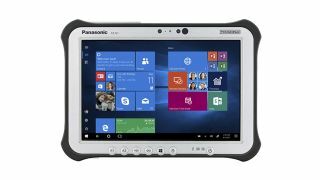 Panasonic has revealed a pair of refreshed rugged Windows 10 tablets with faster processors and an impressively diverse range of configuration options for those who need a slate that can survive in more extreme working environments. The tablets in question are the Panasonic Toughbook FZ-G1 and FZ-M1. They’ve had new processors introduced in the form of the Intel Core i5-7300 vPro and Core i5-7Y57 vPro respectively, and the base model of both comes with 8GB of system RAM and a 256GB SSD. Also, both run Windows 10 Pro. Looking more closely at the FZ-G1 first, aside from the refreshed CPU as mentioned, this 10.1-inch tablet now has an infrared sensor for better security via Windows Hello facial recognition for biometric logins. The front camera is a 2-megapixel affair, while the rear camera is an 8-megapixel model, the latter of which now has an LED flash. On the connectivity front, Panasonic has introduced a dual pass-through antenna (of the external variety) which allows workers in the field to access 4G LTE and GPS simultaneously. And when it comes to Point of Sale usage, a payment sleeve provides integration with the Verifone e355 in order to accept NFC, EMV and MSR payments. The FZ-G1 tablet can also be equipped with a thermal camera as an optional extra, and storage can optionally be pushed up to 1TB (as mentioned, the base SSD is 256GB). So what about the FZ-M1? The new model of this 7-inch tablet incorporates a capacitive touchscreen (16:10 aspect ratio) for use with a stylus, and a ‘bridge battery’ that means you can hot-swap power packs with no need to turn off the device. The slate also comes with an 8-megapixel rear camera, and Panasonic offers a diverse selection of accessories, including carrying cases and hand straps, plus desktop docking stations for when you get back to the office. There are actually six different flavors of the FZ-M1 targeted at various industry sectors, including a model with an Intel RealSense camera – which could be used for architectural design, for example – and one with a thermal imaging camera (FLIR Lepton 3). There’s also a ‘real-time kinematic’ model that can give your location within 10-50cm of accuracy, for those involved in building work and road construction who need that precise level of measurement. Another spin on the tablet boasts a passport reader, and there’s a more sleekly designed, aesthetically pleasing model for use in retail stores. Panasonic provides a three-year warranty and these tablets are available now from authorized resellers, with the FZ-G1 starting at $2,799 (around £2,150, AU$3,800) and the FZ-M1 starting at $2,749 (around £2,110, AU$3,730).